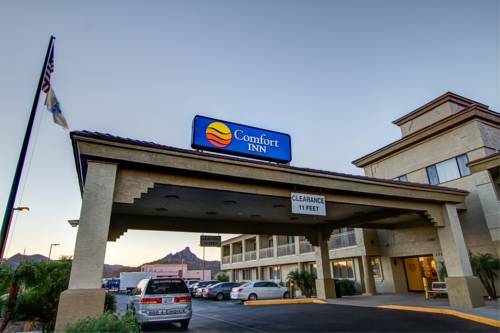 Behind every great day is a great night at the Comfort Inn Fountain Hills-Scottsdale hotel in Fountain Hills, AZ. Our smoke-free hotel is near attractions like the TPC Scottsdale Golf Course, WestWorld Equestrian Center, Barrett-Jackson Collector Car Event and Auction, Sloan Park and the Fort McDowell Casino. Take advantage of our free hot breakfast, free WiFi, fitness center, meeting space and guest laundry services. Guest rooms include coffee makers, refrigerators, microwaves, irons and ironing boards. We also offer membership to the Choice Privileges Program, which gives members the opportunity to earn valuable rewards points toward airline miles, gift cards and free hotel room nights. Pet accommodations: 15.00USD per night, per pet. Pet deposit: 30.00USD. Pet Limit: maximum of 1 pet per room, up to 10 pounds. ~16 miles from Fountain Hills. ~22 miles from Fountain Hills.